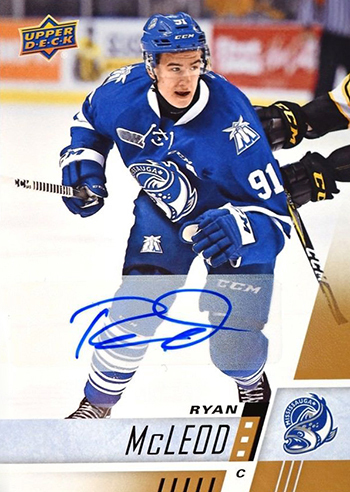 For collectors that may not be familiar with the Canadian Hockey League, it is made up of three smaller loops in the Ontario Hockey League, Quebec Major Junior Hockey League, and Western Hockey League. Spanning all of Canada and several American states, players can be selected by pro teams in the NHL Entry Draft once they are eligible. Once each league completes its respective race to a championship, four teams battle for the Memorial Cup – a trophy which is celebrating its centennial this year. 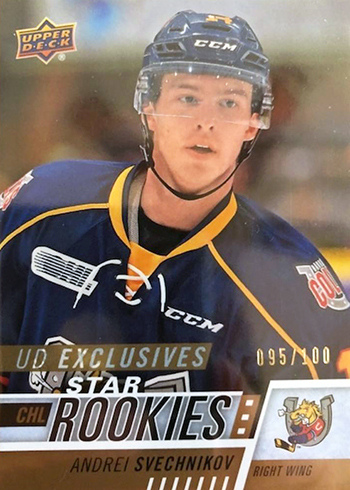 Back at the turn of the century, Upper Deck created some exciting CHL products and this season, collectors have been able to start prospecting once again with a release that hit store shelves last month. 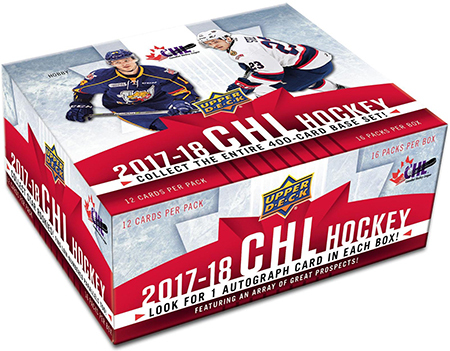 With an expansive and loaded checklist, 2017-18 Upper Deck CHL has a massive 400-card base set that includes 100 short-printed Star Rookies. Drawing from all three leagues and 60 teams, several players from each club are featured. Many players that participated in the 2018 IIHF World Junior Championship made it into the set. 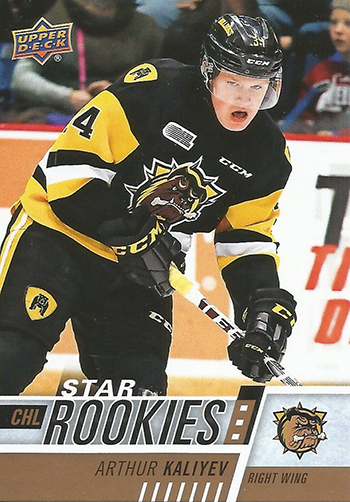 Rated as the top North American skater by NHL Central Scouting, Svechnikov was a solid producer for the OHL’s Barrie Colts during his rookie campaign. Over just 44 games, he scored an impressive 40 goals and earned 72 points to pace the league’s freshman class. The first pick in the 2017 CHL Import Draft also spent some time playing for Russia during international competition. Look for one-of-one printing plates available in packs! Zadina won the Mike Bossy Award as the QMJHL’s Best Professional Prospect following a sensational debut season with the Halifax Mooseheads. He was that loop’s top offensive rookie thanks to a 38-goal and 82-point effort and also averaged over a point per game over two rounds of playoff action. Scouts seem to like that he plays a complete game as well. 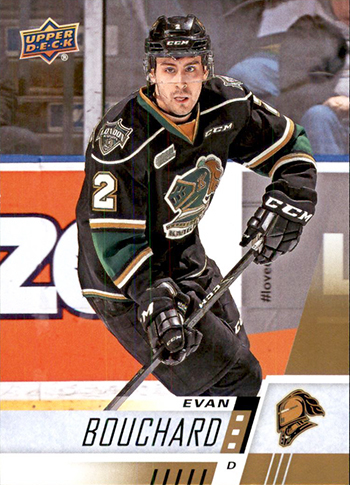 The Knights have produced many solid NHL defenders over the years including former first round picks like Brad Marsh, Rob Ramage, and Olli Maatta. Bouchard is the next in line looking to make the transition to the pro level. 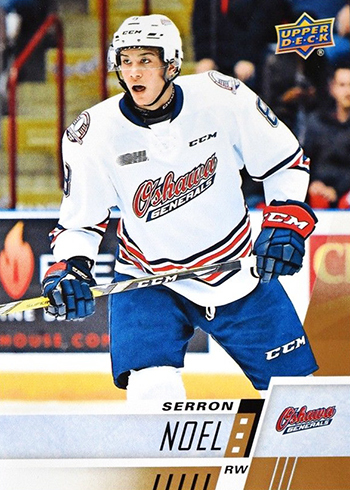 As London’s captain this past season, he produced at a high level and scored 25 times on the way to racking up 87 points – second among OHL blueliners. Dobson has plenty of talent and can make a difference at both ends of the ice for any NHL team that drafts him. 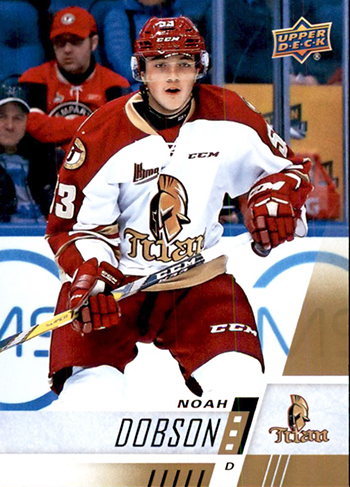 He ranked second among all QMJHL defensemen in scoring with 69 points and led his blueline peers with 276 shots on goal. Named to the league’s First All-Star Team, he was also an assistant captain for the Titan. 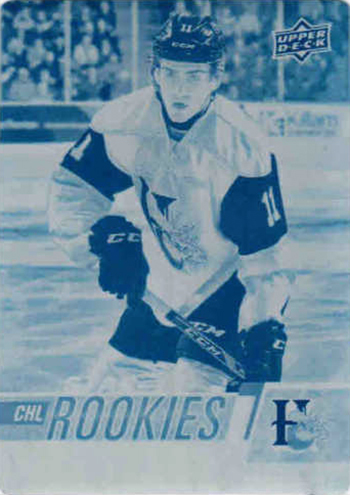 Veleno was granted exceptional status by Hockey Canada in order to get early entry to the Major Junior ranks and while he started the year with the Saint John Sea Dogs, he finished it in a Voltigeurs uniform. With his new club, he took his game to a new level with 48 points over just 33 games before giving a strong effort in the playoffs. 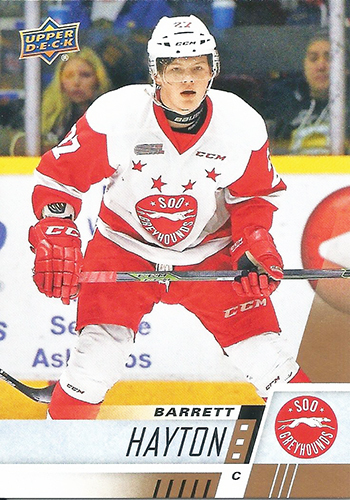 The Greyhounds set franchise records on the way to a regular season championship this year and part of that success can be attributed to Hayton’s progression as a prospect. Able to quickly capitalize on scoring chances, his style can sometimes be compared to that of Boston Bruins star Patrice Bergeron. Noel showed a great deal of improvement in his offensive game as a sophomore with the Generals, posting new career highs with 28 goals and 53 points. Blessed with great size, his stock rose throughout the season and is considered a potential first rounder. He is the son of former CFL player Dean Noel. 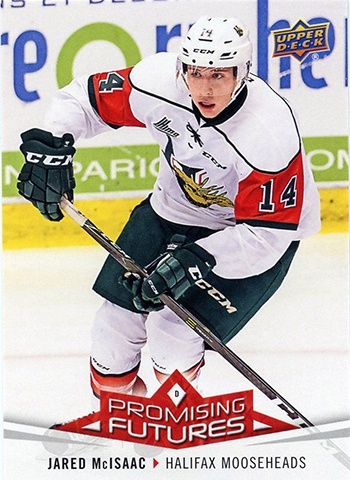 McIsaac was the QMJHL’s Defensive Rookie of the Year in 2016-17 and he was able to shine once again this season with the Mooseheads. On top of posting better numbers as a second-year blueliner, he also showed growth as a defender. His 47 points tied him for 10th at his position and he has a cannon of a shot which strikes fear in opposing goalies. 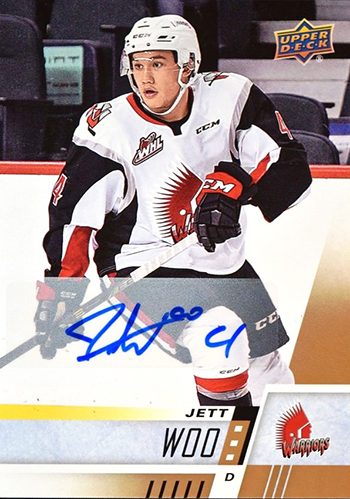 The top pick in the 2015 WHL Bantam Draft, Smith was Spokane’s top defender this season and could eventually prove to be a top-pairing blue line performer once he turns pro. Due to his 73 points, he was second among all WHL defensemen in scoring behind David Quenneville of the Medicine Hat Tigers. 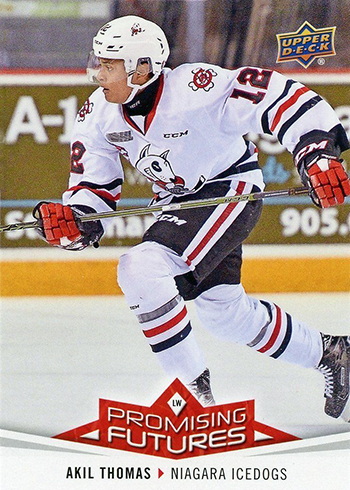 Thomas was a member of the OHL’s First All-Rookie Team in 2016-17 and continued to thrive with the IceDogs this year. His 81 points were good for second on the team behind Sam Miletic, who was picked up mid-season from London. Both his father and uncle played at the minor league level. 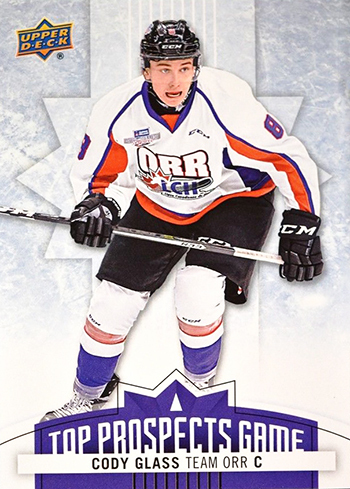 Over three seasons with the Steelheads, McLeod has grown into a fine prospect and had an offensive outbreak in 2017-18. He finished third on the club with 70 points and also paced his teammates with 44 assists. His brother, and teammate, Michael, was selected 12th overall in 2016 by the New Jersey Devils. 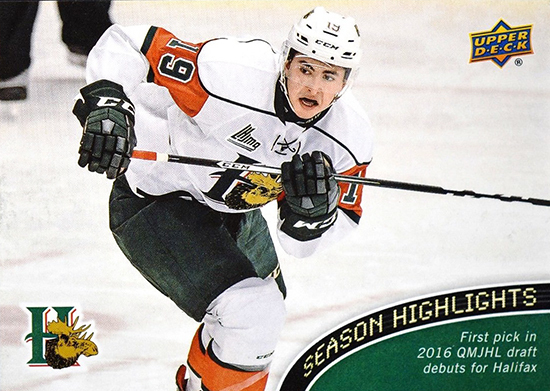 The top pick in the 2016 QMJHL Entry Draft, Groulx saw his numbers grow during his second year with the Mooseheads. He had a great influence growing up as his father, Benoit, is a tenured QMJHL and AHL coach. With a foundation like that, there is a very good possibility that he could prove to be a solid pick. Woo missed a little bit of time due to injury in 2017-18, but he looked strong during the time he was in the lineup for the Warriors. He started the year with seven points in six contests and gets attention for ability to rush with the puck. His father, Larry, spent two seasons in the WHL with the Swift Current Broncos and Victoria Cougars. 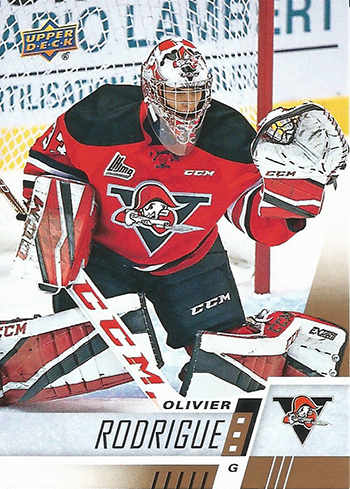 One of the most-improved netminders in 2017-18, Rodrigue saw his wins total jump from a meager 14 to a strong 31 while protecting the crease for the Voltigeurs. His goals-against average dipped by over a goal per game and as a result, NHL® Central Scouting dubbed him the premier North American goalie heading into the draft. 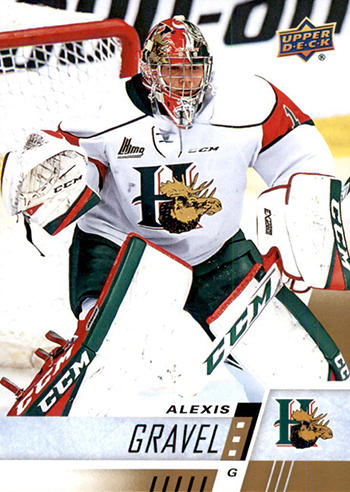 The son of a goalie that was drafted by the Montreal Canadies in 1987, Gravel has been a workhorse for the Mooseheads over the past two years. He closed the regular season with 20 wins and recorded a key shutout to close out the first round battle with the Baie-Comeau Drakkar on March 30. Looking toward the future, the team that built the checklist for the set scouted out some of the brightest CHL prospects heading into future NHL Entry Drafts. The Class of 2019 already has some young stars on the rise and collectors should get acquainted with them now. Arthur Kaliyev of the Hamilton Bulldogs is a goal-scoring machine that lit the lamp 31 times during the regular season and was second among OHL rookies in that category behind Svechnikov. 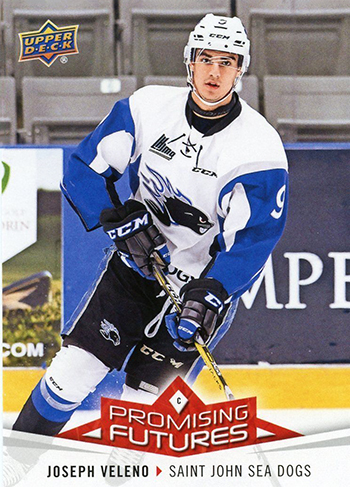 Raphael Lavoie also scored 30 for the Halifax Mooseheads and his stock could continue to rise next season. Other 2019 eligibles that you may want to set aside as you pull their Star Rookies subset cards now include Ryan Suzuki, Bowen Bryam, Blake Murray, Peyton Krebs, Dylan Cozens, Jakob Pelletier, Kirby Dach, and Nolan Foote. Looking even further into the future of the game, there are also a few prime prospects that will hear their names called at the 2020 NHL Entry Draft. Throughout the 2017-18 season, freshman Alexis Lafreniere terrorized opposing netminders as he scored 42 times and amassed 80 points for Rimouski. He was the top choice in the 2017 QMJHL Draft and draws comparison to former Oceanic star Vincent Lecavalier. The Star Rookies collection includes other potential high picks for 2020 such as Brandon Coe, Nick Wong, Justin Barron, Nick Robertson, Braden Schneider, and Rhett Rhinehart. On top of all that, the base set design is a stylistic throwback to Upper Deck’s flagship NHL set from the 2000-01 season. Even if many of the players were toddlers (or not even born) when that classic release was fresh to the hobby, the look has held up nicely over time. The Star Rookies have both limited and numbered Exclusives and High Gloss parallels. All 400 cards have one-of-one Printing Plates along with a Red parallel which can only be found in blaster boxes. 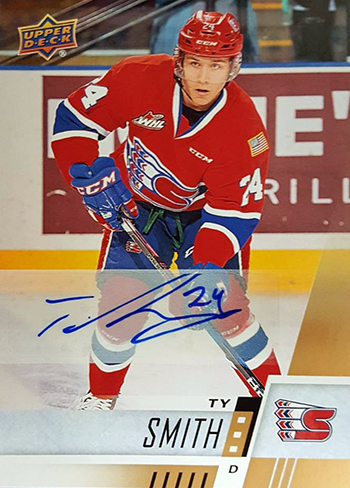 If a big base set was not enough, packs of 2017-18 Upper Deck CHL have plenty of inserts and ink that will appeal to everyone. Autographs drop once per box on average and there are plenty of big junior stars along with a strong selection of Star Rookies featuring player signatures. The roster includes established CHL vets like Morgan Frost, Sam Steel, and Drake Batherson along with fresh faces in Kieffer Bellows. Fans of insert sets will also find three great concepts in packs. Top Prospects Game is all about new sensations which have participated in the CHL’s annual showcase event for draft eligible talents, while Promising Futures examines 20 of today’s best junior stars. Season Highlights, which drop once in very 160 hobby packs, look back at the previous campaign and its most exciting milestones and accomplishments. 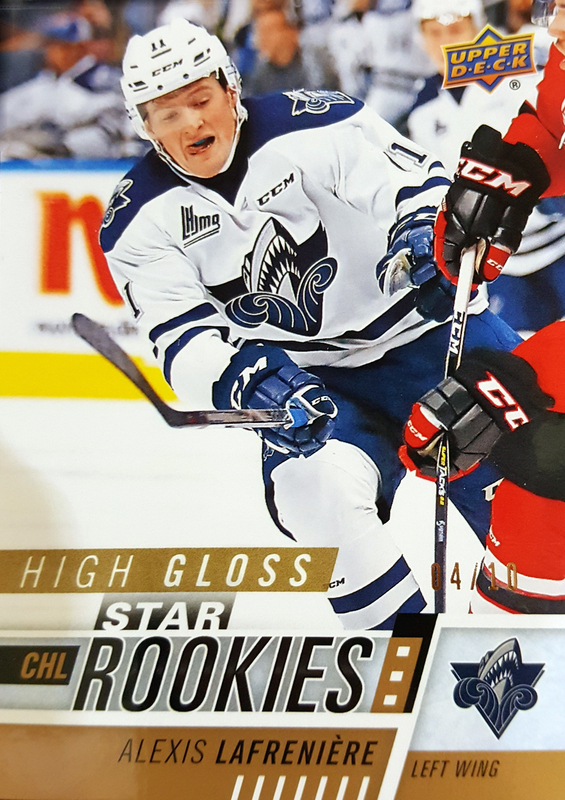 As a debut release, 2017-18 Upper Deck CHL gives collectors a lot to get excited about and also introduces them to the future of the game. Collectors taking a deep dive inside will certainly get in on the ground floor with some prime talent and cracking a few packs could get your team’s next big star.